Translation:Vanya, here is your cocoa. is твоё here used because kakao is neuter? Yes, моё, твоё, наше... are used for neuter nouns. If you listen closely you can hear a pop after "твоё". As far I as can tell, the Russian language doesn't use clicks. You're right it doesn't. The TTS doesn't always have the best pronunciation. What's the difference of вот and здесь? Вот is used to present something: Here is your menu, вот ваше меню. Здесь on the other hand is used to indicate location. Твоя книга здесь. Your book is here. I get the diffetence between здесь and вот - but what about тут? I don't know how to explain it, but it's like the same different between "ecco" and "qui" in italian, or "voici" and "ici" in french. Voilà in french is aswell the same thing, and you use it when something appears (for instance "here you have the money". Before, the money wasn't here, but it appeared right now! That would be the "вот". "здесь" is for the rest. That seems just about right :) it's a good comparison with the french voici and ici. Voici acts as the nominative case for "here" (and replaces the copula "to be"), as in "Voici la pomme" (here is the apple). This is just like "вот" in Russian "вот яблока". Ici means "here" in french when in the accusative case, "la pomme est ici" (the apple is here). that seems to be just like "яблока здесь". I'm pretty sure anyway... It's a bit to remember but I don't mind the different words for cases, just like english I, me, my, mine are really just the same word in different cases. cocoa is not the equivalent of chocolate? yes, that's exactly what i was referring to! Yar, hot cocoa. Mm mmm. I have the feeling I have asked this before, but I can't find it in this list. Is there a significant difference between 'cocoa' and 'chocolate milk' that means the latter is not accepted as a translation? That's cool, but is there and if so, what is it? I found mosfet's comment above, but I don't see the difference between 'chocolate milk' and 'cocoa', since the two are used interchangeably in my country. To me, chocolate milk is a cold drink, while cocoa is presumed to be hot. Also cocoa is likely made with powdered milk, while chocolate milk uses the real stuff. If Russian normally distinguishes between them I can't say. 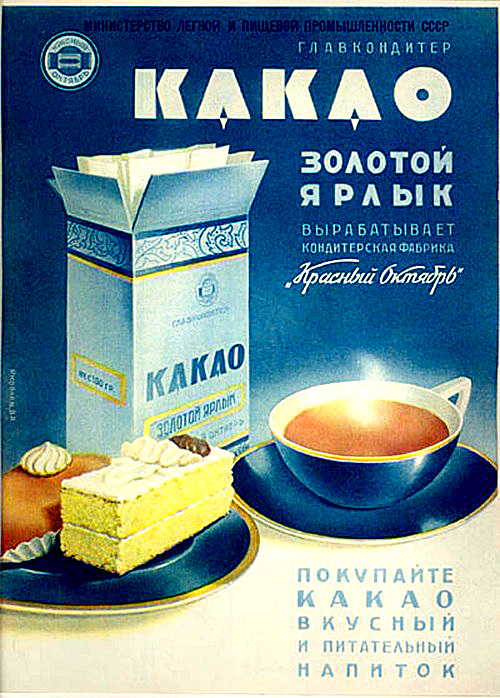 Reverso-context suggests шоколадное молоко for chocolate milk. Powdered milk is not used for cocoa here. It's not very common in households in general (there are no advertisements, I don't know anyone who uses it and don't see it in stores). @Dimidov I would assume that this question is about the drink Mosfet07 linked above. Classical, without any additives of it's own (you put sugar or whatever on your own if you want). Maybe not exactly that very brand, but it's something thick and chocolaty. So the first thing in your list - "powdered cocoa that you add to milk or water, then heat/stir to break the lumps". Does the instant drink in mosfet's picture above not contain powdered milk? Or do you add milk to it rather than water? @Theron nop. Золотой ярлык is classical cocoa powder from pre-Soviet times that contains only cocoa powder and sometimes additional vanilla flavour. Moreover, I wouldn't call it instant because you add it in boiling milk/water and heat it up for 2-3 minutes while stirring and breaking lumps. I think we got a bit confused on the powdered thing. The powder added is cacao powder, which you add to milk or water, and then stir. I realise now we've been saying powdered milk but that is an error on my side. The какао in question here is what, exactly? Is it powdered cocoa that you add to milk or water, then heat/stir to break the lumps? Is it a drink like chocomel, which is milk with cacao but is prepped and ready for use without additional preparations? Is there a difference between this and какао in terms of heat? Like, one is hot, the other is generally drunk cold, etc.? Perhaps served with whipped cream? Amaratea, thank you for your answer. I lost track of the responses for this thread at some point, but I ran into it by accident today and I spied your latest addition to the discussion. Thank you for your input! It's much appreciated. And the nostalgia. I remember Nesquick. Been ages since I had it, though. Cocoa and cacao are the same thing, right ? no. Cocoa is a drink/powder/food product, cacao is the raw product of the cacao tree (beans, unprocessed powder, paste etc) which is used for creating cocoa/chocolate (or non-food products, e.g. cosmetics). In short, cacao = raw, cocoa = processed. However, in English the difference between cocoa and cacao still remains. Because that would be "Твоё какао здесь/тут, Ваня." Vanya and Ivan are not the same here! Be careful! But actually, it is the same name. How does one know where to use твоё or ваш. Can they be used interchangeably? Why is cocoa used so much? Is it THAT important? Why is какао in one sentence translated as hot cacao and in another just as cacao? Cocoa or hot cocoa, or hot chocolate - not cacao. "Cacao" in English is the product from which chocolate is made.